When we think about reducing waste and living a more sustainable lifestyle, a lot of our minds go to ditching plastic silverware, bags, and straws. Buying fruits and vegetables in the produce section that are not wrapped in plastic or bringing our own cups to Starbucks--all of these things relate specifically to food and the kitchen. However when I started writing this series, I started thinking about my beauty/wellness routine. I thought about all of the plastic that currently resides in my makeup bag, my shower, and bathroom cabinets. All of the packaging and containers for my makeup, shampoo and conditioner bottles, and lotion bottles. Plastic, plastic, plastic. I started thinking about the hundreds if not thousands of plastic bottles from shampoo, conditioner, moisturizers, and makeup I had thrown away. I religiously recycle plastic water bottles and plastic packaging in my kitchen, but I have never once recycled anything from my bathroom. How do I fix this? 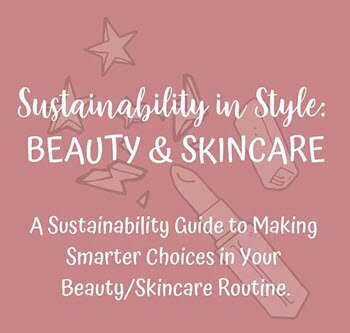 How do I incorporate sustainability practices into my beauty routine? Well, I did a lot of research and I made a guide for making smarter choices when it comes to what you buy for your beauty routine. Check out some old and new brands that have made a decisions to not only be sustainable in their ingredients but also with their packaging. These products are better not only for your skin and hair, but their better for your planet. 3. ALBA BOTANICA. I have been using Alba Botanica Products since I was in high school, and it’s a brand I constantly repurchase. They have everything from skincare to body products (lotions, body washes, etc.) to deodorants. Alba is a one stop shop for skincare and not only do their ingredients rock, but their packaging is typically 100% post consumer recycled resin. 4. LOVE BEAUTY AND PLANET. A fairly young hair and body care company, Love Beauty and Planet have made a commitment to using great, natural ingredients and sustainable packaging. I have used their shampoo in the past (I prefer my no packaging Lush shampoo bar!) and just started using their deodorant! Their deodorant is aluminum free (which is good for our health!) and comes in a recyclable 43% recycled plastic container. Perfect if you’re just starting to make smarter, more sustainable decisions and working to reduce your waste! 5. DR. BRONNER'S. I’d be remiss to write an article about sustainable, all natural beauty/skincare products and not include Dr. Bronner’s line. From toothpaste to all purpose home cleaner, Dr. Bronner’s has just about everything when it comes to getting clean. All of their products are in 100% post consumer recycled plastic bottles and most of their products are multi-use. They use all fair trade ingredients and most of their soaps are biodegradable so you can use them outside when you’re camping. I have used Dr. Bronner’s 18-In-1 Lavender Hemp Soap since I was in college--it’s good for a body wash, pet shampoo, even washing dishes and doing laundry. The key to the soap being so versatile is that it is so concentrated. Make sure to read their directions for how to dilute the soap depending on how you want to use it!